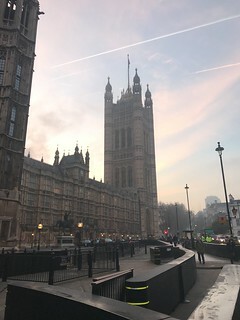 On a cold and foggy December morning I set off for the Mother of Parliaments. 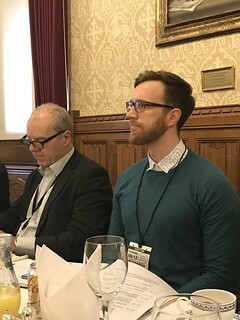 As I had contributed to the Parliamentary Office of Science and Technology (POST) work on shared ledger technologies (SLTs), I had been invited to the House of Lords for a slap-up full English and a discussion on the topic with assembled Lords and Commons. Very exciting for a lad from Swindon. 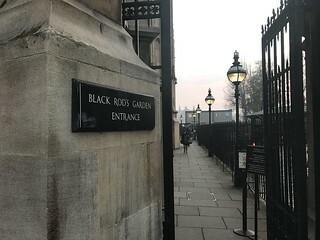 Once I reached the Palace of Westminster I went straight for the Black Rod’s garden gate. But this turned out to be the exit, not the entrance. I went back round to the entrance and found a queue of blockchainafficionadospatiently awaiting the constable in charge of opening the gate at 8am sharp. 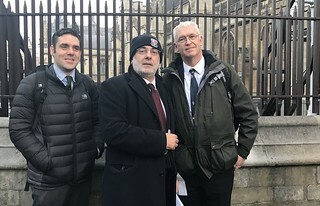 I told the assembled throng (from the STFC) that I was there to lobby parliament to have THE BLOCKCHAIN accepted as a religion, like Scientology, and to have all associated tax breaks and other privileges. They think I’m joking, but they are not entirely sure. They are planning to put physicists on theblockchain, so I am a little suspicious of them. At 8am on the dot the boys in blue let us in. They put my bag and coat and things through an X-ray machine, even though I told them that I had noblockchainsabout my person, and then we were inside the hallowed halls. I began the search for the elusive darkblockchainwith the help of the STFC chaps. No luck. 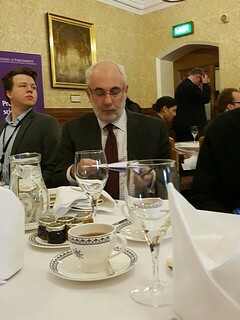 The breakfast was held in the Attlee Room. This is named after Clement Attlee, who led the post-war Labour government in Britain. The picture on the wall behind me is by “Michael Hestletine”, although it wasn’t clear to me whether it was by a Michael Hestletine or by the Michael Hestletine. Much like the distinction between the blockchainand a blockchain, it is rather important in my opinion. I have to say that the slap-up full English was top notch. Two things I particularly liked: they didn’t use cheap sausages (skimping on the sausages ruins a full English in my opinion) and they served the baked beans in a separate little pot (is it called a “ramekin”?) which I really appreciated because I don’t like the beans mixing with the scrambled eggs and tomato. 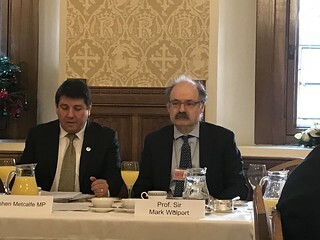 Anyway, to move on, Stephen Metcalfe MP, chair of the Science and Technology Committee, and Sir Mark Walport, the Government’s Chief Scientific Adviser (GCSA), opened the proceedings. Sir Mark had published a report on the technology earlier in the year. 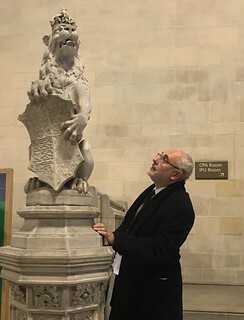 The British Government’s Chief scientific adviser, Sir Mark Walport, has published his Government Office for Science report on “Distributed Ledger Technology: beyond blockchain”. He said that the goal of the POST reports is to demystify technology for policy makers although I have toreport that in his closing remarks he said that we had not been entirely successful in this enterprise and I fully concur with his opinion. Sir Mark comes from the medical profession and he used a pharmacological analogy to introduce the topic to the group, saying that new drugs tend to go through a familiar cycle of “miracle cure” to “wouldn’t give it to a dog” on to “is good for X, Y and Z under certain conditions”. I think he was asking the expert speakers to explain what the X, Y and Z might be and under which conditions. In which case, and I am not casting the first stone here, we failed. Sir Mark, as you might recall, was kind enough to the use the Consult Hyperion model of SLTs in his report mentioned above, gave a couple of examples that – and I say this in a spirit of enquiry and integrity – I just don’t buy. He specifically mentioned the example of constraints on the spending of welfare payments. Now, while I think this is a bad idea, I can think of far easier ways to achieve it (MCC restriction, for example) than tracking everything that welfare recipients spend on a blockchain. I can certainly seethat in the coming world of smart money (i.e., money that is transferred between ~smart ~contracts) it will be possible to constrain, restrict or censor transactions, but who and why are more important questions than how. In any case, who would mine this blockchain? The Department of Work and Pensions and… well, I think I wouldneed to see a more fully-developed architecture to comment. My old friend Simon Taylor from 11:FS had also been asked along to provide input to the discussion and he tried a different set of metaphors relating to the confirmation of events from multiple sources but it was notclear to me that he was able to help Lord Birt and others to understand the key issues. After a while, the discussion moved on to the Estonian electronic identity system. I expressed some scepticism as to whether the Estonian electronic identity system was on a blockchain. The conversation continued. Then to my shame I lost it and began babbling “it’s not a blockchain” until the chairman, in an appropriate and gentlemanly manner, told me to shut up. At this point, Simon and I got into an excellent twitter debate about what might constitute a distributed ledger and whether you need some particular combination of characteristics in order to claim that a system is a distributed ledger and whether, irrespective of the blocks and chains, the blockchain is a sensible description of certain systems. I noted that someone nearby was looking at me with a slightly quizzical expression that I took to be some questioning of my ability to comment on the topic. Well, I went all “don’t bring your knife to my gunfight” on twitter. First of all, one of the first podcasts I ever recorded (a decade ago) was with Tarvi Martens, one of the architects of the scheme. Tarvi kindly contributed a case study on thescheme to my 2007 book “Digital Identity Management” (available from all good bookstores). Forum friend Tarvi Martens presented a case study from Estonia on population-scale identity cards. This had been updated from the original case study that Tarvi kindly contributed to both the Digital Identity Forum and Digital Identity Management. The first card was issued back in 2002 and by October 2006 there were a million cards in circulation. One of the things that I couldn’t help but point out is that the Estonian eID card gained initial traction due to some unusual circumstances. Unusually amongst ID card, the principal use of the Estonian card is an a transit card in Tallin (120,000 people every day use their card for this) and as a travel document. So. The Estonian ID card, which was first issued in 2002, has nothing to do with distributed ledgers or blockchains or any similar technology. End of. Just as the invention of double-entry bookkeeping allowed for the creation of new kinds of enterprise, so it seems to me that the shared ledger will similarly lead to new kinds of enterprise that use the shared ledger application (the SLAPP) as the engine of progress and the focus of innovation. I assume that there are kids in basements experimenting with SLAPPs right now and that this is where the breakthrough use case will come from. As I said last year in a discussion about shared ledgers for land registry, turning the ledger into a platform may be the most important reason for shifting to this implementation. The ability to execute general purpose code on the consensus computer means that, just as the ability to executer general purpose code on conventional computers did, people will create some amazing things that we can’t imagine right now. This will, in the long run, turn out to be much more important than creating a new kind of database. When I wrote this I was thinking that the ideas for these new kinds of applications can only come from fresh perspectives, but I have changed my opinion on that having seen some of the work already going on the field. Maybe some of us old hands still have something to offer when it comes to rethinking the ways markets can work. All in all, a very interesting start to the day. 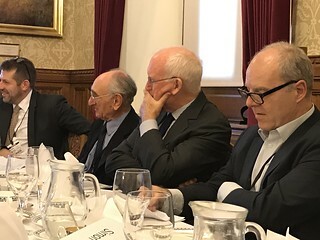 Incidentally, the only people around the table who made complete sense, as far as I could tell, were Professor Vili Lehdonvirta from the Oxford Internet Institute (who talked about the need for control and governance) and Calogero Scibatta of Everledger who, of course, actually already has a business that depends on shared ledgers. 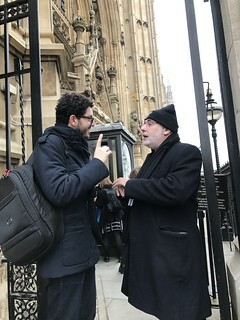 Here I am with Calogero on the way out, still discussing whether the ontological classification of Bitcoin recapitulates its phylogeny or whether it should be re-classified according to external definitions unrelated to its history and development. In other words, just because it was designed to be decentralised doesn’t mean it is decentralised. Vendor: We are using the blockchain to revolutionise [redacted]. Me: What’s in the blocks? Vendor: We don’t need to use blocks westore each transaction in such a way that only the parties to the transaction can see it. Me: Who forms the consensus? Vendor: It’s a master-slave consensus so the purchaser has a master record and the suppliers have a copy of it. Me: How are the transactions chained together? Vendor: They store the transaction but we also store the hash of each transaction. Vendor: Because blockchain (I’m paraphrasing). If Roger Ver is the undisputed Bitcoin Jesus, then I claim that after yesterday’s performance my position as the Blockchain Meldrew is now unassailable. While I appreciate the promotion, I suspect you mean Stephen Metcalfe rather than Stephen Murdoch MP.